Next year’s lunch will be held on Friday, 27th March 2020 at the Park Plaza Riverbank Hotel, Albert Embankment. Please put the date in your diary now. This year's lunch was held on Friday, 8th March 2019. Report to appear shortly. 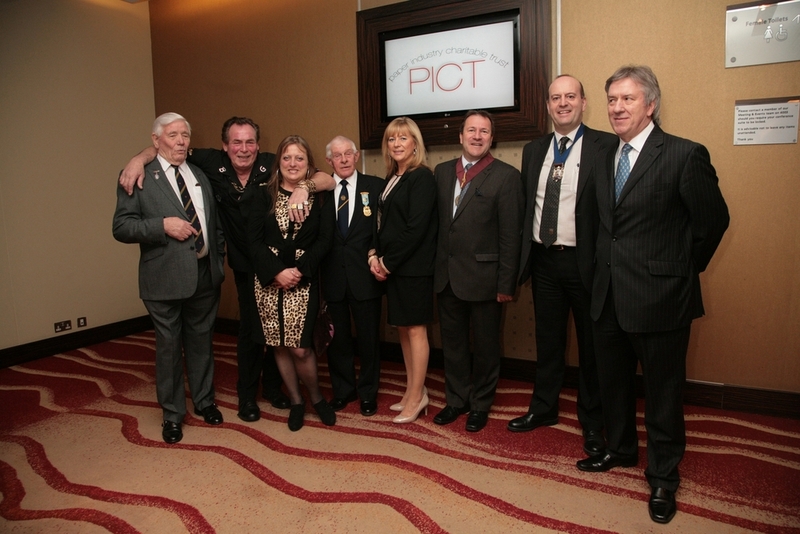 Fortunately Friday 9th March was the date chosen for PICT’s Annual lunch. Fortunate, as the week prior had been thick snow in most parts of the country. In fact, the new President made reference to this in his speech, saying: “I doubt we’d have seen so many of us here today, able to join us to celebrate this wonderful occasion.” And a wonderful occasion it was too. Held at the Riverbank Park Plaza Hotel on London’s Albert Embankment, this the 9th Annual Lunch followed the earlier AGM and the requisite pre-luncheon drinks. When all the guests had assembled in the Plaza Suite, and the loyal toast had been given, the President drank to all the past-Presidents, the Committee, colleagues from Papico and PICT’s new Treasurer, Robert Lockwood. The starter was then served, a tasty goat cheese and caramelised onion tart, which was followed by the esteemed game of Heads and Tails – always an entertaining interlude. As usual, your Editor was out in an early round, however, it got down to four contestants, ‘Gladys Knight and her pips’ quipped adjudicator Peter Bothwick. And then it was two - Tails was called out and a winner announced. When all had re-taken their seats, Andy Thompson and Peter Bothwick continued by giving details of the fundraising auction that would be taking place during the afternoon. In fact, they took this opportunity to auction two items, namely a round of golf at Burr Hill and an overnight stay at the Park Plaza Hotel, which were snapped up by the guests. of the Lancashire 25 Club; Paul Tooby, from the Birmingham Paper Trade Social Society; and the immediate past President, Joe Piggott. He also gave a special thanks to the charity’s Secretary, Anne James “who keeps us on the straight and narrow”. In his speech, Paul commented about some of the UK’s news and sport that had occurred over the past 12 months, including the British team’s most successful Winter Olympics ever. Adding that it had been such a wonderful event that the whole country had to be treated to a week of ice and snow as practice for the next games, thanks to the Beast from the East and Storm Emma! He went on to talk about PICT’s sporting sections, saying that it would be good to revive the Cricket Section, so if any members were even marginally interested in cricket they should get in touch and get involved. He also mentioned the possibility of two new sections – Walking Football and resurrecting a Bowls Team – again contact Secretary Anne James for more information. Talking about the lunch itself, Paul explained that it was not just the networking, socialising and fun aspect, but crucially the lunch was to raise funds in support of the PICT charity. He continued: “Can we all say, hand on heart, that our colleagues in the office know why we are here today? And no, the answer isn’t just for the wine!” He asked the guests to tell their workmates that there is a worthwhile charity within the trade that needs everyone’s support, which provides valuable assistance to those in need, following their years of service in the paper sector. He talked of ways that people can be involved including; the Annual lunch; the sporting sections; joining the 200 Club; and promoting colleagues to become members of PICT. He continued by talking of the charity’s work. “The mission of this charity is to offer funding to those who’ve left this industry and who’ve found times difficult. Without your support we could not do this.” He then thanked the Trustees, Peter Bothwick and Andy Thompson for all their hard work in reviewing and making donations to those in need, a role, which he explained was very demanding and sometimes upsetting. Finally, Paul thanked the Committee for their hard work, and in particular PICT’s Secretary Anne James, presenting her with a beautiful bouquet of flowers, in recognition of her continual guidance and support to the Trust. When the applause had faded, Paul welcomed the after-lunch speaker, Robbie Glen, to the stage. After regaling many stories and anecdotes, Robbie concluded by quoting, and very fittingly, some ‘Rabbie’ Burns – of course! Peter Bothwick once again took to the stage and thanked Robbie for his entertaining insight. He then proceeded to auction the final items, which included amongst others: Four-ball golf at Westerham; a trip on the Solent; and a private box for four people to see Barry Manilow at the 02. The winners of the table raffle were also announced. And then that was it. An excellent afternoon of entertainment, fine food and camaraderie had come to a close. However, most of the guests did continue in the time-honoured fashion of the paper industry by ‘networking’ either in the bar or the local hostelry next door! We now all look forward to next year’s fundraising lunch. Copped a brilliant Annual Lunch! Thanking Peter for his introduction, Joe Piggott then took to the podium and said that he was honoured to be PICT’s new President. He went on to thank everyone for their support of the Charity and especially the financial support “for those less fortunately than ourselves”. He went onto introduce his special guests at the dinner, who included amongst others, William Alden MBE DL, Clerk to The Stationers’ Company and Peter Millington, President of the Lancashire Paper Trade 25 Club. Joe’s next task was to present Nick Gee with his past President’s badge, on doing so he said how Nick had been very supportive of all the sporting activities during his term, participating in the majority of events. Following this, he went onto talk about PICT and its mission, commenting that the Charity was probably unique in Europe and possibly even the wider world in its achievements. He added that the fun and friendships in the sporting sections were all raising monies for the charity. He then made a plea for the generous support of the charitable trust – mentioning that many colleagues’ lives are a struggle – and that members can help to alleviate these by not only participating in the auctions and events at the lunch but also participating in the sporting and other events during the year. Finishing his speech, Joe then went onto introduce the afternoon’s entertainer – Alfie Moore. Taking the stage and setting the tone for the entertainment to follow, Alfie introduced himself as coming from the UK’s City of Culture – adding most people in Hull were quite shocked at this award – and that there are now City of Hull bus tours, which involve getting on a bus and driving straight to York! A serving police sergeant, Alfie states he came from an engineering background, and was bought up on American cop shows – “unfortunately though I haven’t got the name – Dirty Harry sounds cool – but Dirty Alf ….! !” he quipped. Talking of his career, he said that questions are often asked of him such as ‘why aren’t you out catching the real criminals?’ – “Too dangerous! !” he laughed. Another anecdote during Alfie’s stories to cause much amusement was on discussing Tasers, he said that they are a good piece of protection – and on a positive note – they show that everyone has a dancing ability!! Alfie Moore was definitely an excellent choice as an after lunch entertainer, he was very funny and droll and definitely gave a different perspective on the boys in blue…!! And everyone appeared to thoroughly enjoy it. After the laughter had subsided and all had gained their composure, Peter Bothwick and Andy Thompson once again took to the stage to auction off the final items, which included boat trips; Rugby tickets; and the use of a villa in Turkey. Rounding off the afternoon, President Joe Piggott presented the Charity’s Secretary Anne James with a bouquet of flowers, thanking her for all her hard work. He then added that the official proceedings had come to an end and that the rest of the afternoon was free for people to enjoy and network further. And that is exactly what they did, in the time-honoured tradition of the paper industry, in both the bar and the nearest public house until the small hours of the morning. Once again, a brilliantly successful lunch raising funds for PICT and its charitable causes. The 8th Annual PICT lunch was held on Friday 3rd March 2017 in the new City Suite at the Riverbank Park Plaza hotel on London’s south bank. The lunch followed the Trust’s AGM, which was held earlier in the same hotel (minutes from this meeting are further on in the newsletter). Once the winning participants had retaken their seats, Andy Thompson joined Peter to announce details of the fundraising auction that would take place during the afternoon and, in fact, they took the opportunity to auction the first couple of items – namely 4 Ball Golf at Westerham and an overnight stay at the Park Plaza hotel. Anyway, back to the lunch itself, following a delicious Chicken Rossini main course, the auction then continued, with further top class items going under the hammer – these included an England Rugby Training Shirt signed by the England squad; and two tours for four people of Sky TV Studios including lunch. A delicious pudding of warm Victoria Plum Tart Tartin was then served, along with coffees and liqueurs. A quick comfort break and then it was the turn of Peter Bothwick to formally introduce PICT’s new President Joe Piggott to the diners in his own inimitable style that we have all come to expect. With regards Joe’s career, he told the assembled diners that Joe had achieved 52 years in the paper industry. In summing up, Peter said that Joe would hold the office with immense enthusiasm. The PICT annual luncheon took place on Friday 4th March, 2016 at the Riverbank Park Plaza Hotel in London. The highlight of the PICT calendar and its biggest fundraiser during the year, the lunch attracted over 260 members and, in my opinion, it seemed busier and buzzier than last year’s event. Unfortunately, the hotel in its wisdom has decided to refurbish the delightful Thames Suite, which overlooks the River Thames, to become its main restaurant and no longer a function room, so we were in the Plaza Suite. However, this was perfectly adequate and I personally don’t believe it detracted from the proceedings or, in fact, the excellent food and service the hotel provides. The lunch followed a busy AGM for some of us (minutes of this a little further on) and for others a couple of liveners in the hotel bar. Proceedings kicked off with the industry’s very own Master of Ceremonies, Peter Bothwick, who welcomed everyone to the 7th Annual PICT lunch and explained what the guests could expect from the afternoon, namely a raffle, an auction of top items and a variant on the game of heads and tails, as well as an unusual entertainer. He then introduced PICT’s new President Nick Gee, quipping that it was “out with the old and in with the not so old”. Nick Gee stood up and proposed a toast to the Past President, Andy Thompson, the sporting sections and winners, and the new Vice President – Joe Piggott, who was then called upon to give grace in his usual witty manner. Following a tasty Venison Terrine starter, the game of knife, fork and spoon took place – this is played along the same lines as heads and tails – but obviously as the name describes it’s played with cutlery not coins. Joe Claydon was the winner of this fun version. After a tasty main course, Peter Bothwick and Andy Thompson (aka the Chuckle brothers – only kidding guys!) went onto announce some of the items up for auction – these included golf days, tours of the Sky Complex, boat trips and hotel breaks. After some hot bidding by the guests, and much monies raised, a yummy lemon tart desert was served. Then following the coffees and liqueurs, Peter Bothwick, in his own inimitable style, formally introduced PICT’s new president – Nick Gee. He stated that the new President had the most distinctive and infectious laugh in the industry, saying that he joined Denmaur in 1979 as he was cheaper than an ansaphone …… ! Taking the podium, Nick Gee began by thanking Peter for his kind introduction and that his speech would be short as would like to enjoy a drink. He thanked everyone for their warm welcome, and in particular, the raucous applause from his colleagues at Denmaur Independent “who are clearly aware that pay review time is not far away”. He went onto welcome the official guests, namely: Mrs Helen Esmonde – Master of The Worshipful Company of Stationers and Newspaper Makers; Mr Peter Millington – President of the Lancashire Paper Trade 25 Club; and Mr Paul Tooby of The Birmingham Paper Trade Social Society. He also welcomed all the guests of PICT members. He added: “Nobody is more surprised than me, to find me standing here as President of the Paper Industry’s Charitable Trust. He then went onto say that since the last annual lunch much had changed in the world of UK paper merchanting and manufacturing with long established British brands disappearing. He continued by saying that if sport wasn’t your thing, the immediate past President Andy Thompson was hoping to organise a number of regional PICT quiz nights, and that details would be posted on the PICT website. Nick then took the opportunity of presenting Andy with his past President’s badge and thanked him for his year in office. He also welcomed to the PICT Board the new Vice President, Joe Piggott. Nick then joked that at the recent Oscar ceremony nominees were told to keep their speeches short and when their time was up a red light would show. He said “I know that by now my red light is flashing and that the guest artist is more appealing than me. “However, just like the Oscars, before I finish there are some important thankyou’s I would like to make.” He went onto thank PICT’s Secretary Anne James “who once again is the driving force behind making this event come together and so much else behind the scenes throughout the year.” He thanked the Sporting Section Secretaries, promising that during his year as President, he would make every effort to attend at least one of each of their events. He also gave a special mention to the Board and Committee for the time they give the charity. Finally, on behalf of PICT, he thanked all those companies and individuals that had generously donated prizes and auction lots at the lunch. His final task was to introduce the guest artiste, Mr Graham Jolley, and hoped that everyone would enjoy the rest of the afternoon. Graham Jolley is described as a psychological entertainer, able to perform any number of astonishing feats, baffling and thrilling his audience. And this he certainly did in large amounts – from magic tricks to mind reading. By the end of his act – I don’t believe there were many left in the audience wondering how on earth he did some of the things he did. He involved many of the guests in his tricks, and even yours truly was beckoned on stage and I still to this day don’t know how he managed to know the phone number I had picked from a very large phone directory ….. he definitely left me baffled. A hard act to follow, but after the magical entertainment Andy Thompson and Peter Bothwick rounded off the afternoon by auctioning the final items. Then, as quickly as it had started, the formal part of the Annual Lunch was over – although as ever the jollities and networking continued into the small hours in the bar. Once again, a successful event for PICT raising funds for the charity and, in turn, a brilliant fun filled afternoon. The highlight of the PICT calendar – the Annual Luncheon – was held on Friday 6th March in the stunning Thames Suite at London’s Park Plaza Hotel, which overlooks the River Thames and the Houses of Parliament. This, the 6th Annual PICT Charity lunch, followed a well attended AGM (report further on), along with a couple of pre-luncheon drinks. Not only is this lunch the industry’s largest social networking gathering of the year, but it is also PICT’s largest fundraising event, with around 260 members and guests coming along to this formal yet fun filled afternoon. Proceedings began with the paper industry’s own presenter and comedian, Peter Bothwick, welcoming everyone to the lunch saying: “There will be short speeches, high quality auction items, and a high quality guest speaker.” He went onto say there would also be the usual fun ‘Heads and Tails’ after the starter, and a Raffle draw with cash prizes [a comment which drew a big ooooh from the audience!]. Joe Piggott was then called upon to say grace in his own unique style. After a fine starter of Venison Terrine, Heads and Tails took place – it got very tense – down to six .. and then two ... John Tootle and Peter Brown – Peter Brown won and very kindly donated his bottle of champagne to the raffle. Following the main course, the new President, Andy Thompson, took wine with the Committee, sport section secretaries and winners, and the new Vice President, who he named as Nick Gee. A scrumptious pudding of champagne and strawberry torte rounded off the lunch, then Andy Thompson announced the prize draw – however there appeared to be some discrepancy with a signature and it was a Mr O’Neill that was finally declared the winner. As the coffees and liqueurs were being consumed, Peter Bothwick took to the podium again to formally introduce the new PICT President – although not much introduction was needed as Andy Thompson had already held the post in 2012. A fact, indeed, not missed by Peter who said it was the first time since 1949 that a person had been bought back to hold the post again. Thanking Peter for his ‘kind’ introduction Andy Thompson came back to the podium where he welcomed everyone to the lunch and said that in his speech he would give an update on the Trust’s position and aims, stating: “I will keep the formal parts of the luncheon brief and to the point, whilst ensuring that everyone is made aware of the Charity’s purpose, challenges and intentions for the future.” But first came the thank you’s – he welcomed the top table guests and, in particular, thanked Anne James for all her hard work. He thanked Denmaur for its Gold and GF Smith for its Silver sponsorship of the luncheon. He also thanked PaperlinX for its monthly donations. He went on to thank the sports secretaries, and also thank Bev Steele for all his hard work as Editor of the PICT Newsletter and his hilarious stories. He then went onto thank the hotel and staff and everyone that works backstage. He continued by announcing that Patrick Shorten had stood down last year and Barry Fowler this year as Trustee, and went on to award Barry Fowler life membership. He then awarded Alan Babcock with his past President’s badge. In conclusion, he summed up by sayingthat company operations were changing and that it was now a more challenging industry. Adding: “PICT is there to help those that need help and are in need.” At the end of his speech, Andy went onto introduce the guest speaker Peter Brackley, who hails from the world of sport broadcasting. Addressing the audience, Peter jokingly commentated that he probably wasn’t top choice for presenter; and went on to say that he had brought along an item for the auction – whereby he held up a tiny Chelsea jumper – saying it had been used by Dennis Wise .... which gained a titter from those in the audience of a certain age that would remember this diminutive footballer, especially for his time with Chelsea in 1990-2001, where he also became Captain. The afternoon continued with the auction – which offered a selection of top items including boat trips on the Solent, golf days, vouchers for London theatre tickets and tours of the BBC – and raised good monies to the PICT funds. In fact, in total, the lunch raised £11,800. Andy Thompson rounded off the official part of the afternoon, by once again thanking all the sponsors, and hoped that all the members and guests would continue to enjoy the rest of the day. The PICT Lunch is always special. It is that occasion when once a year Trade people meet for lunch to talk and enjoy and to be entertained. Friday 7th March was certainly one of those. It began in Suite 6 at the Park Plaza Hotel on the Albert Embankment with the AGM the Minutes of which shall be shown elsewhere in this Newsletter but I can tell that is was well attended and lasted for 30 minutes. During this time the out-going President Jeremy Martin briefly summed up his year in office, all the ups and downs of his time and passed the President’s Badge to Alan Badcock. With the new President firmly ensconced, Andy Thompson was elected to become the Vice-President despite having been President in 2012 and was given his badge of office. John Garlick delivered the Treasurer’s Report in his own measured and concise manner followed by Patrick Shorten with that of the Trustees. Regarding Patrick it was an especially poignant occasion in that he announced his retirement from that post which he has held for 7 years. He was applauded to the echo for his sterling work and his counsel will surely be missed. Peter Bothwick was elected to become a Trustee so he with Barry Fowler and Andy Thompson make up our complement of three. The 200 Club draw was called and the meeting was concluded. We then left to join the other Members and their guests who for the record numbered 234 in all, in the Thames Suite, a lovely room offering an inspiring prospect of the Thames with the Houses of Parliament just across the water. This really was impressive and made a splendid backdrop to our proceedings. Peter Bothwick was our Master of Ceremonies for this occasion, a role he played magnificently and much aided by a very good sound system. He began the proceedings telling us all of what was to come and for us to elect Table Captains to oversee the various charity happenings round the tables. The Heads and Tails game proved as popular as ever and Chris Godfrey was the winner and received a £100 wine voucher. Not bad for standing up and sitting down a few times! Then the speeches. Mike Gee spoke of the commitment of the donors to PICT and then proceeded to give an extensive account of the life and times of our new President Alan Badcock, As I have made a profile of Alan’s life further along in this newsletter I will not enlarge further here on what Mike had to say but rest assured it was all very amusing and positive. Then came the President’s turn and he told us of his aims and vision for the Charity in a speech that was quietly impassioned if that is not too much of a paradox which were to encourage progress and make a drive to increase membership. Also to find more of those in need. He thanked Patrick Shorten for his many years of dedication. Then we were to be entertained by our guest speaker Gary Richardson Sports journalist and Commentator sans pareil. A very, very funny man indeed. His “day job” is with the BBC heard on Radio 4’s flagship Today programme that goes out weekday mornings. Those that know the programme will have heard Gary managing to shoehorn within his reporting duties amusing stories and asides . His act is largely about these in a more developed form and of his mistakes both on and off air. Hilarious stuff. For my money he could have stayed with the microphone for the rest of the afternoon. A very well chosen performer. In addition he kindly offered as a auction prizes two 2 hour visits, accompanied by himself, to Broadcasting House to watch a sports programme being broadcast. What with Mr Richardson and our very own Peter Bothwick, no mean performer himself we were very well entertained . With the guest speaker’s conclusion the afternoon came to its formal end and the members and guests gently eased away many to the hotel bars or other more local watering holes . In retrospect a very good day indeed and another very successful Lunch. Bobby George the pro dart player was our MC for the proceedings. On the tables were forms for the “silent” and general auction plus 200 Club joining forms. The first thing you do, and it has become a regular item now, is to play the Heads and Tails game. My table was pretty well wiped out to a man on the first call but on the premise that it is better to be lucky than beautiful Ron Ingafield won. The President’s speech was made with his usual eloquence pressing us to support the Charity. He thanked all the donors including those generous folk that donated the auction prizes. He insisted that Patrick Shorten stood to take a tumultuous round of applause from us all for his good work and it was then he passed the Past President’s Badge to Andy Thompson. Nick Gee looking tanned and fit just back from ski-ing somewhere high and cold, responded for the Guests with a very witty well chosen form of words touching on the many facets of our new President both amusing and serious. He was followed by Ben Collins aka THE STIG who gave us a noisy and fascinating romp through motor sport with descriptions of his many achievements on the track and his time with Clarkson and crew on Top Gear. For us petrol heads Ben’s performance at the Lunch was simply the business. The auctions and the darts game were called by Bobby George and it is about this part of the afternoon that comment must be made. It is something of a first for this editor to tell of negative feed back, but much of this was received. Mr George scarcely managed to keep us all together, and his language was not appropriate to this event. That we are aware we did not get it right this time is an understatement despite achieving a good result for the charity but this will not be allowed to happen again. To remedy this the committee has put together a special working party to make improvements for the future. With this in view we ask those that were offended by this part of the afternoon to give us another chance to get it right next year. It would be a shame verging on tragedy if it were allowed to interfere with the important work this charity does for those in need.